I’m particularly proud of this book. I hadn’t initially planned to write Berhane’s story, but I wrote a short story to explain her to myself, and the story grew. I suddenly realized why I had introduced her in A Murder of Clones. 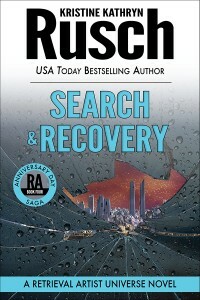 A lot of characters in Search & Recovery become important later on, so don’t miss this one! 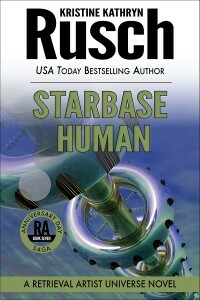 Plus, the preorder for Starbase Human has just become available for the ebook on iTunes, Amazon, and Kobo. You can also preorder the audio book. I’m afraid the rest of you who have other devices or want the trade paper will have to wait until May. 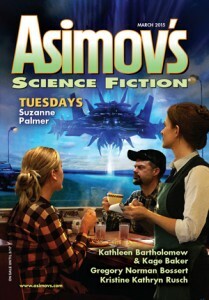 But to tide you over until Starbase Human’s release, Asimov’s just published a new Retrieval Artist novella. Fair warning: this novella is a standalone section of Starbase Human. However, if you’re jonesing for some DeRicci, you’ll find her here. You can read an excerpt here. « A Murder of Clones Published!